How to Home my Dobot? DobotStudio just crashed for no reason and I can’t get it to work! As we work with our new products, it’s not uncommon for us to find small bugs and issues that we don’t see documented elsewhere on the internet. When that happens, we work hard to find a solution or workaround, and post it to this blog! The Dobot uses a suction cup attached to an air pump to create a vacuum seal on objects you want to grab, and releases that seal when it’s time to drop the object. Dobot suction cup is blowing air out! This is the strangest and most elusive problem we have encountered. I suspect it occurs when the Dobot attachment has recently been switched from the gripper to the suction cup. 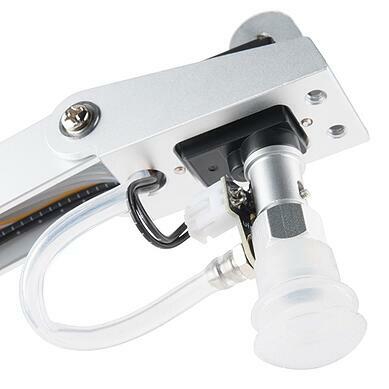 The gripper uses the air pump to both open and close, using both positive and negative air pressure. The suction cup only uses negative air pressure (or none at all). You may have received a suction cup with a missing/undersized/partly blocked inner hole. Don’t worry, this is an easy fix. When using the suction cup od Dobot, you may hear the air pump humming, but the suction cup isn't sucking hard enough to create a vacuum. If you experience a low suction / low pick up rate, you would like to look inside the suction cup and make sure there's no obstruction to the air flow. Sometimes the rubber isn't cut all the way through, you would like to peel it off / remove it, to allow the pump to create the vaccum. What is included in the RobotsLAB-BOX? 50 Lessons and Quizzes covering standards in Algebra, Physics, Geometry, Trigonometry and Pre-Calculus, 4 Robots, 1 10.1" Tablet, 12 Accessories, a transport case and 1 Year Warranty.